Auxetic materials, structures, fabrics (or also “Auxetics”, a term that commonly groups all of them) are materials that exhibit an unexpected behaviour when they are subjected to mechanical stresses and strains. When they’re stretched in the longitudinal direction, they become thicker in one or several of the perpendicular width-wise directions. The same logic applies in the opposite way: when they are subjected to uniaxial compression, they display a “thinning” in one or several of the transverse directions (Fig. 1). This phenomenon was first identified and reported by the German physicist Woldemar Voigt in the early 1900’s when he was experimenting with iron pyrite. Voigt didn’t succeed on finding the logical explanation for it, though, and his discovery was ignored for decades. It was not until 1982 that auxetic materials gained further attention, when LJ. Gibson described the auxetic effect using two-dimensional Silicone rubber and Aluminum honeycombs that could be deformed by flexure of the ribs. Then, in the late 1980s, the first auxetic-foam was intentionally designed and manufactured (, , ) which represented a major breakthrough as it demonstrated that auxetic effects can be induced on almost any material structure through its design. From that moment on, the scientific community clearly realized the potential functionalities of these type of materials as shock absorbers, filters, composites, biomedical implants, etc. That effect can be induced in a particular material by means of altering its internal (micro)structure and making it properly cooperate with the way the material deforms when loaded. This is done by means of modifying and geometrically fine-tuning it. 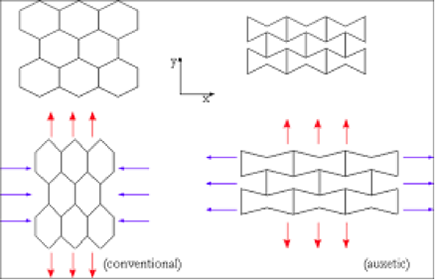 By this appropriate deformation modes and mechanisms are obtained upon mechanical solicitation of the material. These eventually result in a non-intuitive deformation behavior showing effects such as thickening when stretched – thinning when compressed-volume increase upon stretching etc. This geometrical control of the structure (or microstructure when it’s a foam/bulk polymer/etc.) can be easily observed when looking at macroscopic structures. Carefully designed structures, practiced for example in fabrics by controlled placement of the yarns/stitches/knit loops, etc., generate the auxetic effects, as can be seen in the comparison below (Fig. 2) between cell-structured fabrics. In that particular case, upon stretching both cell-based structures in the Y-direction (red arrows), the conventional structured-fabric displays a “thinning” in the X-direction, while the auxetic one shows a thickening. Some additional examples of auxetic structures can be seen on Fig. 3. Fig. 2: Comparison of the behavior upon longitudinal deformation between conventional and auxetic structured fabrics. Fig. 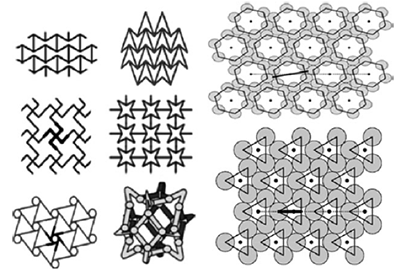 3: Several examples of auxetic structure-patterns. This allows for the particular mechanism of “rotation of rigid units” in a special way that gives birth to the auxetic behavior in the case of foams . The auxetic foams were found to be able to dissipate a significantly higher amount of energy upon impact when compared to conventional PU foam (Fig. 4). The auxetic effect has already found several applications in many diverse industries, such as military, biomedical, aerospace and textile apparel sectors. This has been possible due to the ability to synthesize such materials on almost any major material-type including polymers, metals, ceramics and composites. A great variety of methods were effectively transferred and scaled-up from universities and technical centers to the industry along the last 30 years . Even so, to further increase their application possibilities and further extend their presence in the industry and our daily lives, a more inter-disciplinary approach is needed. Combining the auxetic behavior and the manufacturing techniques with other known-effects such as shape-memory, electromagnetic effect, nanostructured materials and others would largely increase the range of existing applications and could even enhance mechanical properties and deformation mechanisms. Fig. 5: Auxetic weft-knitted fabrics developed based on different geometrical arrangements: (a) Miura-ori pattern; (b) rotating squares; (c) re-entrant hexagons (after Hu et al. 66 and Liu et al. 65 ). 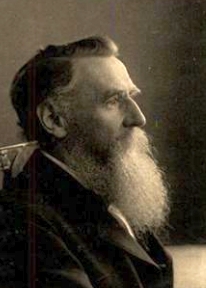 Lakes, R.S. (1987-02-27), “Foam structures with a negative Poisson’s ratio”, Science, 235 (4792): 1038–40, Bibcode:1987Sci…235.1038L, doi:10.1126/science.235.4792.1038,PMID 17782252. Evans, Ken (1991), “Auxetic polymers: a new range of materials”, Endeavour, 15: 170–174, doi:10.1016/0160-9327(91)90123-S.
 Chiang F. Major Accomplishments in Composite Materials and Sandwich Structures. In: Daniel IM, Gdoutos EE, Rajapakse YDS, editors. Heidelberg, Germany: Springer; 2009. 779-98 pp.